After ten days in Tennessee, Kim and I made the short hop to northern Kentucky. We spent five days at the Kentucky Horse Park Campground on the outskirts of Lexington. We loved it! The rolling green grassy hills. Lexington isn’t nearly as wooded as the places we’ve visited over the last six months. Believe it or not, Savannah’s swamps and marshes actually contain tons of trees. And the first few stops on our trips — Asheville, Pigeon Forge, Nashville — were also wooded. Lexington has trees, but mostly it’s wide-open pasture-land. It made for a nice change of pace. Horse culture. Kim has loved horses since she was a little girl. I used to be afraid of them — I had a bad experience when I was young — but by watching through Kim’s eyes, I’m learning to like them too. Lexington is the horse capital of the country (and the world? ), so Kim was in seventh heaven. Bourbon. I like whisky. While I prefer Scotch whisky, I can appreciate a good bourbon. Lexington (and nearby Louisville) produces vast quantities of the stuff, and there are lots of whisky-related things to do and see. Low cost of living. It was fun for me (as a financial writer) to see how cheap things are in Lexington. We could enjoy a nice meal for a fraction of what we’re used to. Plus, I had a lot of fun using the Redfin app on my phone to look at home prices as we drove around. Homes are cheap here! Location, location, location. Like Cincinnati (which is only ninety minutes away), Lexington enjoys a terrific location. It’s near enough to the Great Lakes (and cities like Chicago), within a day’s drive of the eastern seaboard, and also serves as a gateway to the South. If there’s a central hub for the eastern United States, Lexington could be it. As always, we visited with friends while we were in Kentucky. We ate lunch with my friend Tash, with whom I worked at the family box factory back in the 1990s. It was great to see her. Plus, our friend Amy drove down from Cincinnati to spend a day with us. We had a lot of fun with her. 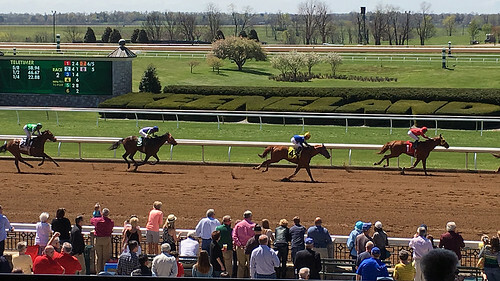 For our fourth anniversary as a couple, Kim and I visited Keeneland, one of the most popular race tracks in the United States. I’d never seen live horse racing before, so this was a new experience for me. Niether one of us really enjoys gambling, but we decided to make small wagers on each race. We’re glad we did. It added to the fun. I gave myself a budget of fifty bucks, which allowed me to make ten $5 bets over the course of nine races. I ended the day with $53, which means I earned a six-percent return in four hours. Maybe I should switch from index funds to horse racing? As a whisky fan, I was eager to visit the local bourbon distilleries. While we had fun sampling the local wares, we learned that whisky tasting isn’t quite as fun as wine tasting. We’ve done a lot of wine tasting over the past four years, and we’re familiar with how that works: walk up to the counter and sample various selections. That not how whisky tasting works. 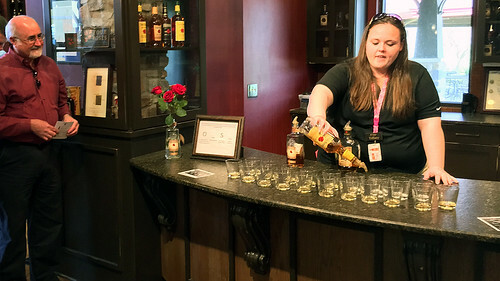 With whisky tasting, you have to take a tour first. Then you’re given three or four samples of specific products. Each distillery produces a wide range of whiskies for various markets, but they’re not about to share the bourbon they market in Japan, for instance. No matter. We still enjoyed seeing the process. After five nights in Lexington, it was time to move on. On a quiet Sunday morning, we hitched up the Mini Cooper and drove west to St. Louis.